On January 28, 2013, members of the Okeechobee County Chapter of Students Working Against Tobacco (SWAT) participated in the Legislative Delegation Meeting. The annual meeting, which is held to give local governmental agencies and citizens a chance to voice their issues for Legislative Session in Tallahassee, was held at the County Commission Chambers. This year, the Okeechobee Legislative delegation includes first-term Senator Denise Grimsley, and freshman Representative Cary Pigman. 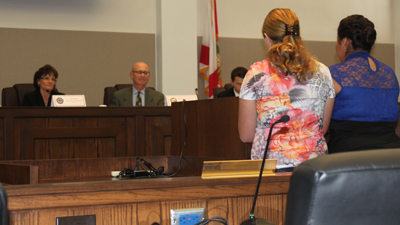 After a brief introduction by Candace Pope, Tobacco Prevention Specialist in Okeechobee County, the two students addressed the delegation. Paola Prado, a student at Okeechobee High School, discussed the two main issues confronting youth in Okeechobee County: youth exposure to secondhand smoke, and youth access to flavored tobacco products. "SWAT and the Partnership work with County Commissioners, community partners, and other decision-makers to pass tobacco-control polices to address these issues," said Miss Prado. "We helped coordinate a successful campaign to design, pay for, and post 'Please Don't Smoke Around Children' signs in all county parks." 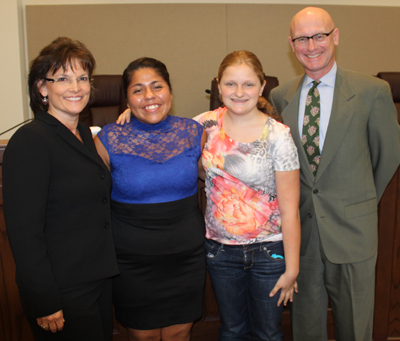 "We spoke at the County Commissioners meeting where commissioners voted to pass a County Resolution to restrict the sale of candy-flavored tobacco," said Savannah Goggans, who attends Yearling Middle School. "And just a few weeks ago, we spoke at the local School Board meeting about banning tobacco on our school campuses. 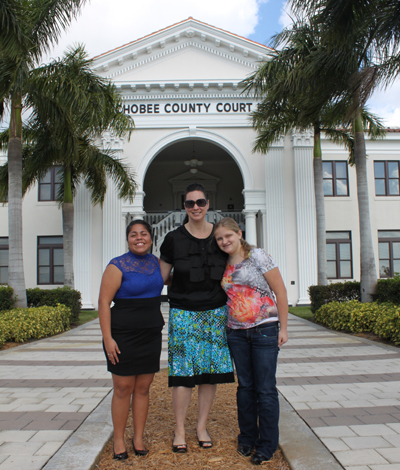 The School Board unanimously agreed to make our schools tobacco-free in Okeechobee County," added Miss Goggans. After completing their remarks, the attendees in the gallery applauded the SWAT students. The students also had an opportunity to talk to the very gracious legislators at the conclusion of the meeting. The girls reflected on the opportunities that their participation in the SWAT program has given them. "The SWAT program has allowed me to make a difference in my community," said Miss Prado. "This program gives youth all over the state like me a chance to do these awesome things, and I hope you see that a difference it makes in middle and high school aged youth." SWAT has given me the chance to stand up for something I believe in, to speak out and make my voice heard," added Miss Goggans. "Since joining SWAT, I have become more bold and outgoing. I have already seen the positive changes that have taken place in our county because of SWAT." With these powerful young voices, the future of Florida is in good hands!